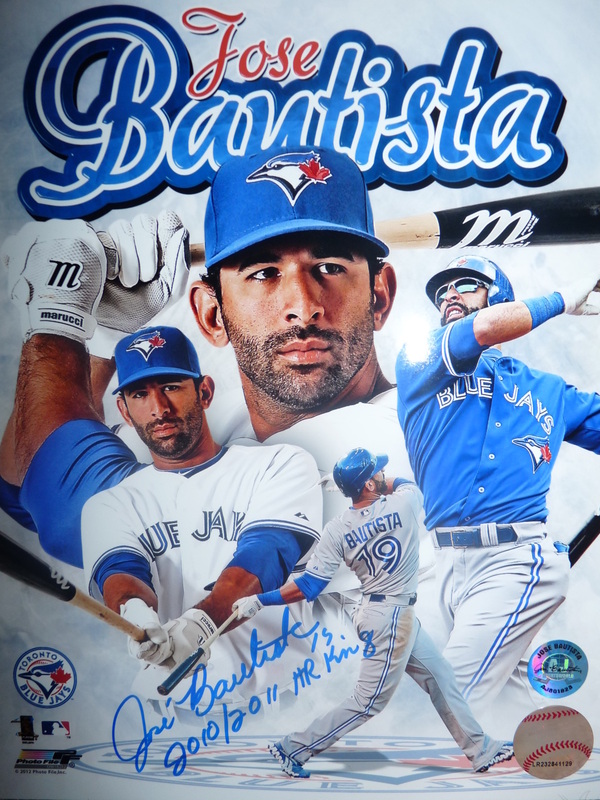 Jose Bautista has emerged as one of the premier hitters in Major League Baseball. Over the past several seasons, Bautista has made the Toronto Blue Jays into true contenders in the American League while posting historic numbers and maintaining a humble, hard-working, genuine persona throughout his rise to super-stardom. 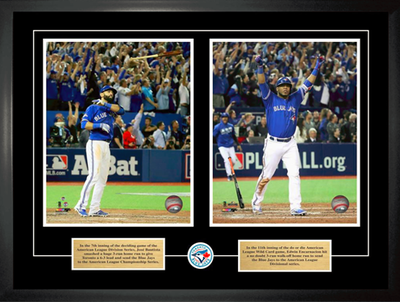 The Blue Jays slugger led all of Major League Baseball in home runs in 2010 and 2011. 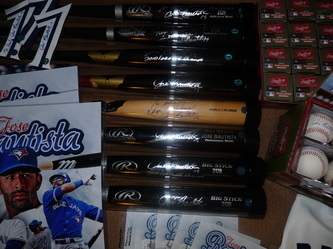 He is a five-time All-Star (2010-2014), two-time Hank Aaron Award winner (2010, 2011), and two-time Silver Slugger Award winner (2010, 2011). With 7.6 million votes, Jose was the leading vote-getter in all of Major League Baseball for the 2011 All-Star Game. 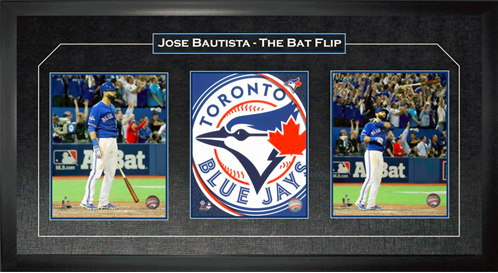 In 2014, Jose once again led all of MLB in fan votes and participated in his third Home Run Derby, where he was named Captain of the American League. 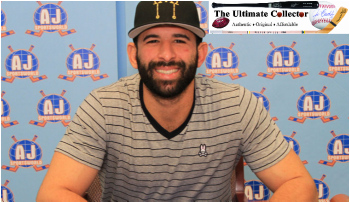 With his tremendous on-field success and off-field demeanor, Jose has truly become an icon in Canada and one of Major League Baseball’s best players. 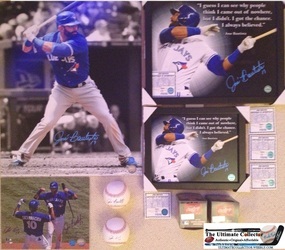 All items are hand signed, beautifully and personally autographed by Jose Bautista. To protect your investment, a Certificate Of Authenticity and tamper evident hologram is included (most from A.J. Sports World) with your purchase for an unconditional lifetime guarantee of authenticity. Most items are from our private signing in June, 2012. 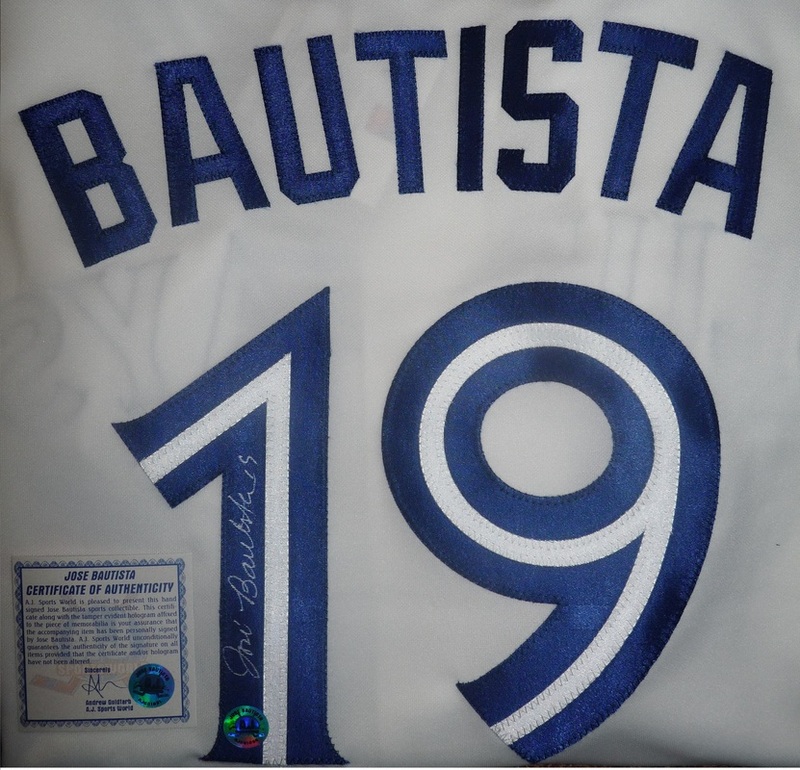 Hand signed Toronto Blue Jays white (home) Replica Sewn Jersey by Jose Bautista with a silver sharpie, includes a certificate of authenticity from AJ Sports, Jose Bautista official. ONLY 1 available at this price, please contact us before buying! Jose Bautista Signed Toronto Blue Jays 16x20 Photo with "HR King"
Hand signed Toronto Blue Jays 16x20 RARE collage photo with "2010/ 2011 HR King" inscribed by Jose Bautista with a blue sharpie, includes a certificate of authenticity from AJ Sports, Jose Bautista official. 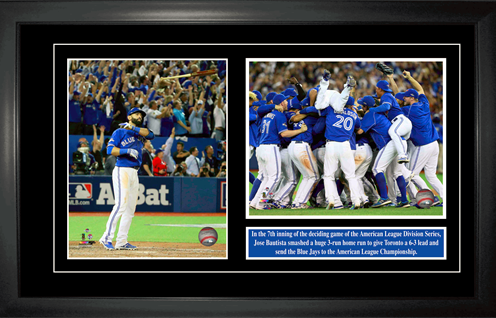 This photo frame features two 8x10" Toronto Blue Jays photos. The first is the iconic Bautista bat flip image from game 5 of the 2015 ALDS, and the second is a team celebration image from the same game. 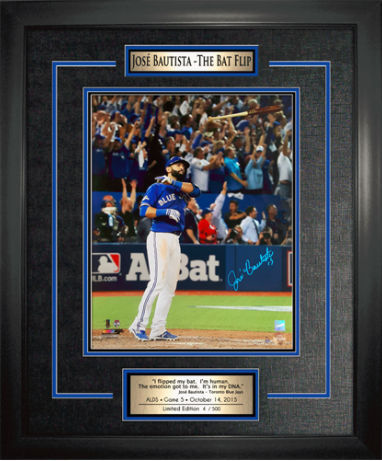 In the 7th inning of the deciding game of the American League Division Series, Jose Bautista smashed a huge 3-run home run to give Toronto a decisive 6-3 lead and propel the Toronto Blue Jays to the American League Championship. 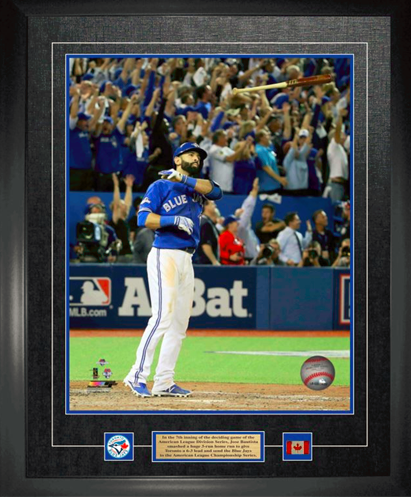 This frame commemorates one of the greatest moments in Toronto Blue Jays history, and the most memorable moment in the last 22 years. 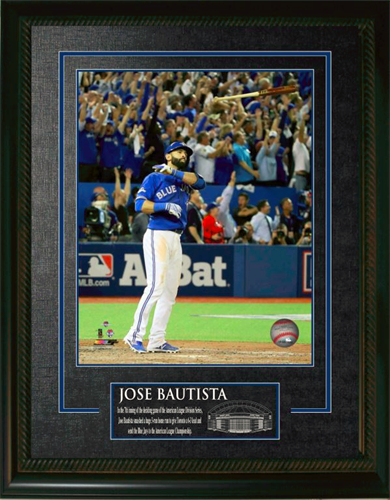 It comes complete with double matting, decorative v-groove inlay, and a descriptive name plate. The frame comes ready to hang with 2 hooks and a hanging wire. 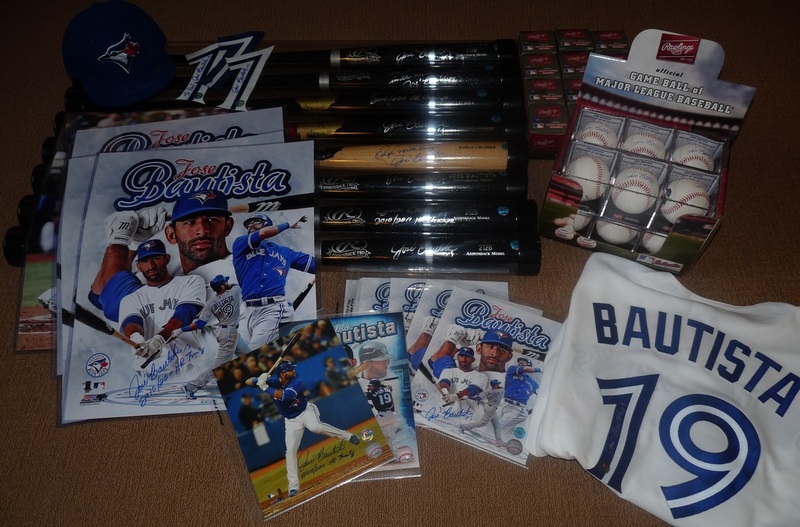 Prices do not including shipping: we ship worldwide!